This weekend's Season 43 finale of Saturday Night Live featured a sketch in which U.S. President Donald Trump and his legal team appear in the iconic last scene from The Sopranos. Like the HBO mob drama's infamous closer, the 5-minute, SNL version saw the story's central characters sitting in a diner talking about life and ended with the screen going to black, leaving it up to the audience to decide what happened to them. In case anyone missed the reference, it also featured Journey's "Don't Stop Believin'" playing in the background and Alex Moffat as Eric Trump struggling to parallel park a child's toy bike outside the restaurant. Alec Baldwin reprised his role of Trump in the clip, which has gotten nearly 700,000 views on YouTube since it was posted Saturday evening. 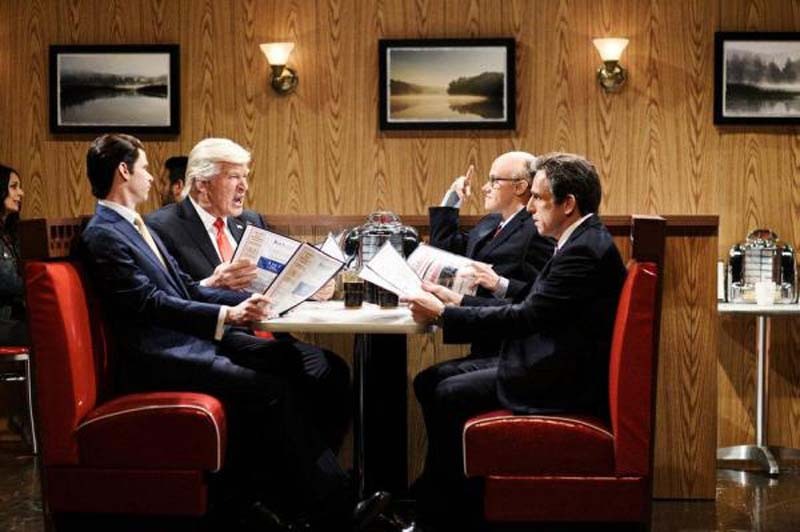 The video also saw Robert De Niro and Ben Stiller return as Robert Mueller and Michael Cohen, while SNL regulars Kate McKinnon and Mikey Day once again played Rudy Giuliani and Donald Trump Jr.
Mueller, who is investigating the Trump presidential campaign's possible collusion with Russia, is seen walking past the group in the eatery and giving Trump a look to let him know he is watching him.